"Hi, meet Jackson shown here as a 2-month-old puppy, weighing about 4 lbs. 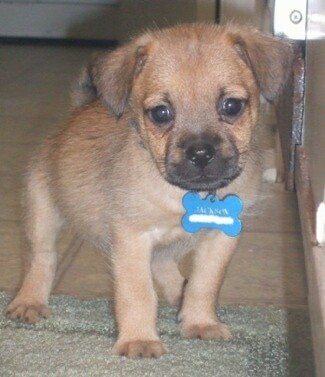 He is a mix of a Norwich Terrier and Pug. He loves to dig and only barks if he is bored. He is a very active and very smart puppy. He is a hunter and will attack your feet if you’re not careful. I take him outside several times a day so he can run and dig in his favorite areas." The Pugwich is not a purebred dog. It is a cross between the Pug and the Norwich Terrier. The best way to determine the temperament of a mixed breed is to look up all breeds in the cross and know you can get any combination of any of the characteristics found in either breed. Not all of these designer hybrid dogs being bred are 50% purebred to 50% purebred. It is very common for breeders to breed multi-generation crosses.